Do you need to say thank you to an employee for a job well done? How about a colleague who helped you at work? A thank you letter is a great way to show your appreciation for someone at work. Here is a variety of employee thank you letter examples, which you can edit to fit your own personal and professional circumstances. Also read below for tips on how to send an appropriate thank you letter. Choose the Method: Your thanks can be sent as a written letter, a thank you note, or an email thank you message. All three are appropriate. A written letter is the most formal, a thank you note is more personal, and an email is a great idea when the time is of the essence. Use a Clear Subject Line: When you're sending an email, thank you letter to an employee or colleague, the subject line of your email message can simply say "Thank You." Consider Handwriting Your Letter: A handwritten thank you note always makes a really good impression. It is more personal than a typed letter or email. Keep It Short: Do not write an extremely long thank you message. Keep it short and sweet – simply explain what you are thanking them for, and express your gratitude. Send Sooner Rather Than Later: It is always a good idea to send a thank you message as soon as possible, while the event is fresh in the person’s mind. Of course, sending a thank you message late is better than never sending one at all. Edit, Edit, Edit: Be sure to proofread your letter for any spelling or grammar mistakes thoroughly. This is still a professional message, so you want it to be polished. Send It! When in doubt, say thank you. It is never inappropriate to give thanks, however, small the reason. People love to know they are appreciated, especially in the workplace. 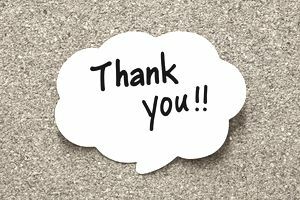 Review these letter and email message examples saying thank you to employees, and see below for more examples of how to show your appreciation and say thank you. Thank you so much for your assistance during our office move. You and your staff really came through, proving what it means to be a "team player." The extra effort you all put in was really appreciated. Thank you for all your help on our recent company-wide restructure. It was really helpful to have your input since you went through a similar reorganization at your previous company. I'm happy to have you as a part of this team. In the short time, you have been here, you have really helped to make things run smoothly. I really appreciate your willingness to help out wherever needed. It's that kind of flexibility and dedication that will help this company grow to its full potential. I really appreciate all your help in getting the restaurant ready for our grand re-opening. I'm glad that you have decided to stay with us during this time of change, and seem to be looking forward to the opportunities this new venture will bring. Your positive attitude has made a big difference in the way the rest of the staff has viewed the coming changes, and I really appreciate your support. Thanks so much for helping out while Janice is out on maternity leave. I really appreciate you offering to work more hours and to help out with some of the extra things that she's had time to do up until now. I really appreciate your assistance. It's hard in a small business when one of us is out for a long period of time, and it's employees like you who help to make it work for us all.